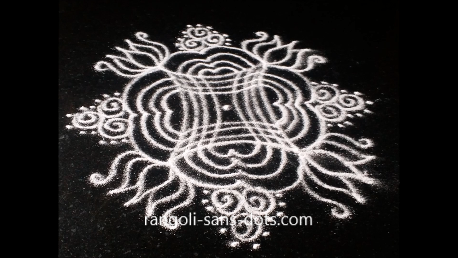 Special functions and festivals demand special kolam. 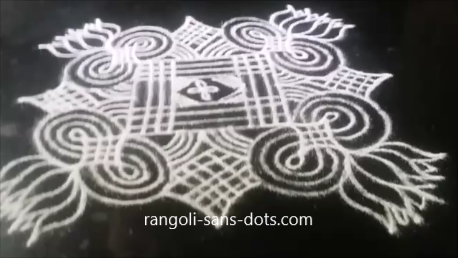 This traditional rangoli with line of symmetry demand some skill in drawing the series of concentric curved lines. 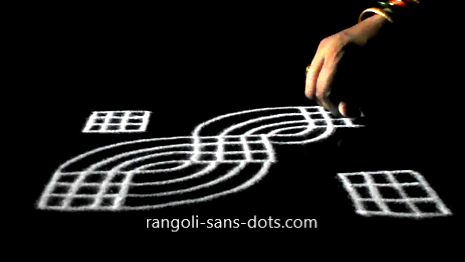 Otherwise it is an easy design only. 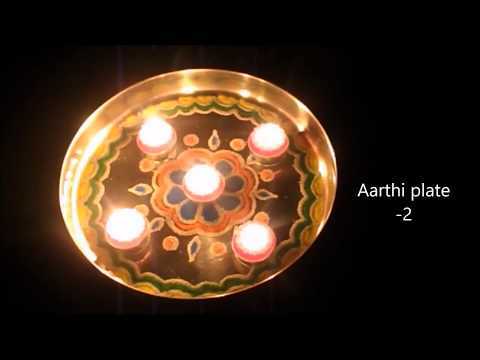 We celebrate Navratri for nine days or rather nine nights , hence the name Navratri. 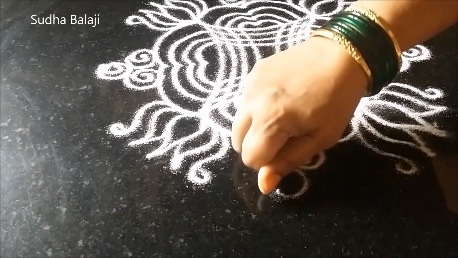 Starting with the first day apart from various decorations we do for the kolu with craft and art, tradition has it that we draw a new kolam for the kolu every day. 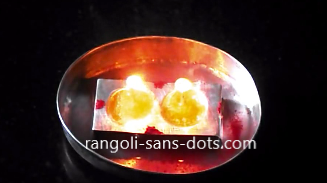 Till Dasara or Dusshera or Vijayadasami the celebrations are on. 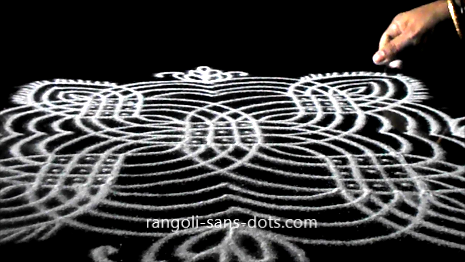 The kolam below is suitable for Ayudha Pooja and Vijayadasami . 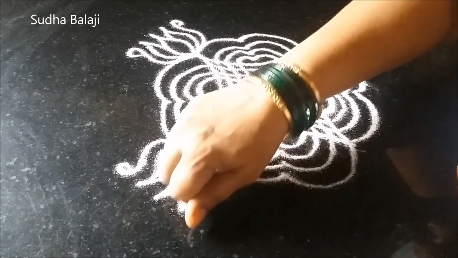 A simple lines kolam can be drawn for decorating the kolu for one of the days of Navaratri particularly on a Navarathri Friday. 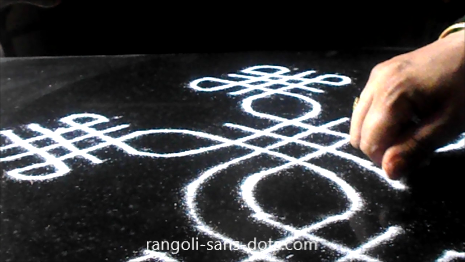 The images below show how a simple lines kolam is drawn. 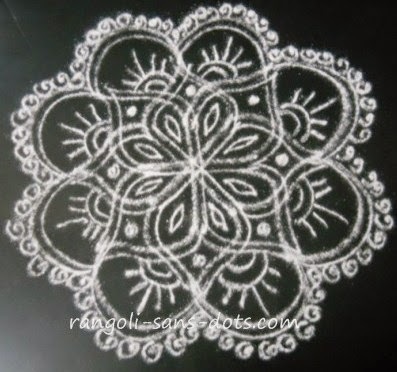 It is not a classical padi kolam, because according to my kolam tradition, we start padi kolam with a square base drawn with four or five lines. 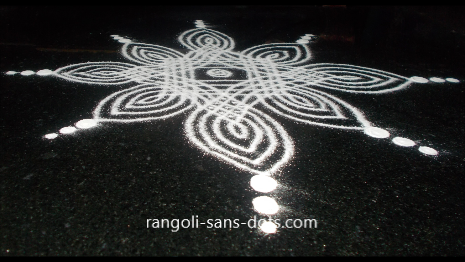 I usually draw four lines and for festivals I use five lines and decorate the kolam with neli or curved lines also. 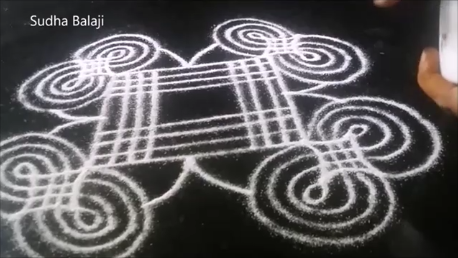 This type of kolam uses small squares , placed in various patterns and using lines square grids are drawn and they are connected by curved lines. 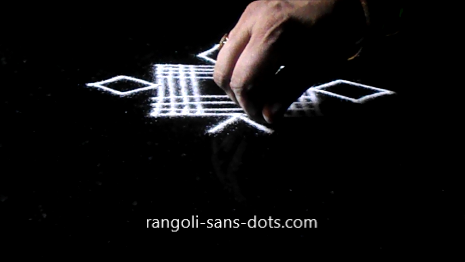 Finally we can decorate the kolam with free hand patterns or motifs to enhance the beauty of the kolam. 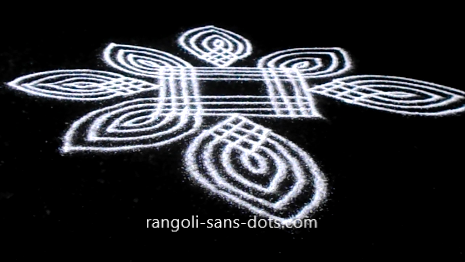 The final picture of these kolam usually appear to make them appear complicated, actually they are very easy when viewed as separate elements. 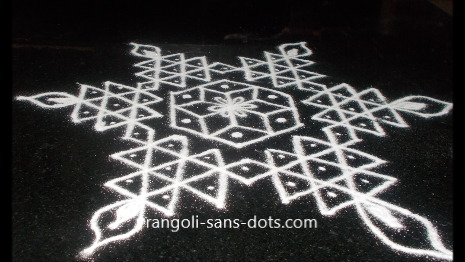 The pictures should make the kolam self explanatory, I hope. 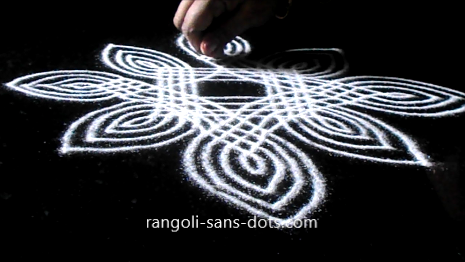 This post will predominantly have padi kolam and other kolam with lines ( also called geethaa muggulu In Telugu ) for a change a simple free hand kolam has also been added. 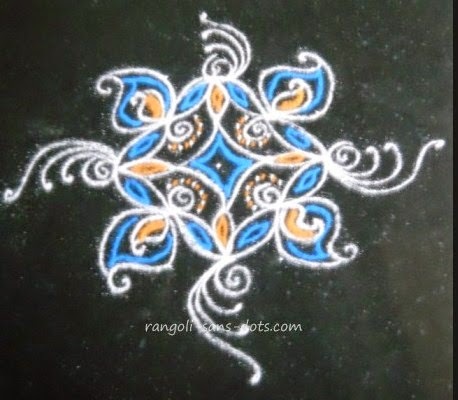 This is a simple free hand kolam with white ,blue and orange combination that can be drawn for the kolu particularly if there is lack of space. 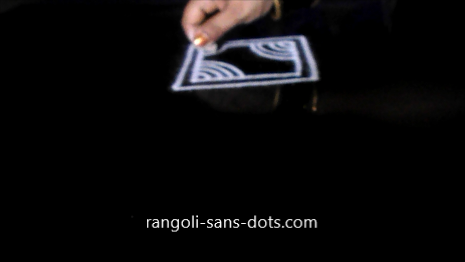 Small is beautiful as some would agree. 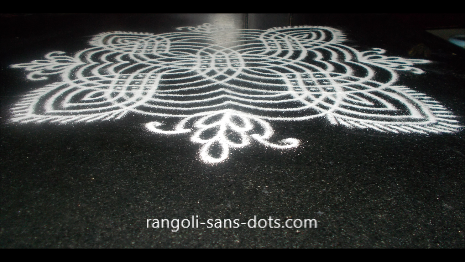 Following the tradition is more important , if we have space we can draw big kolam with lots of colours too. 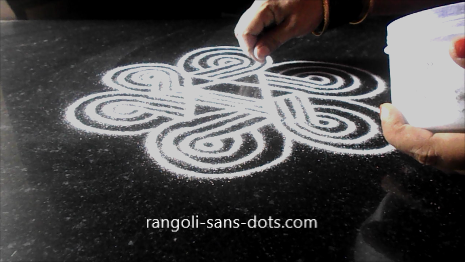 Using a simple lines kolam theme that is used in padi kolam we can draw a basic kolam with lines that can be drawn for festivals like Navratri and Varalakshmi Vratham. 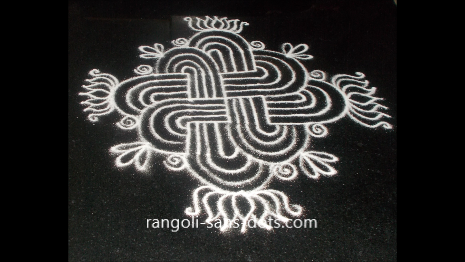 As usual decorate with a kaavi also called geru or red ochre border to highlight the fact that these are been drawn for festivals. 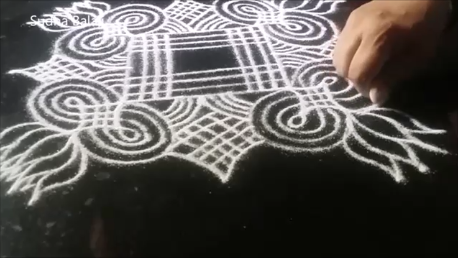 This kolam can be drawn for the golu or for as a Varalakshmi Vratham Pooja kolam before the mandapam where we keep the kalasam. 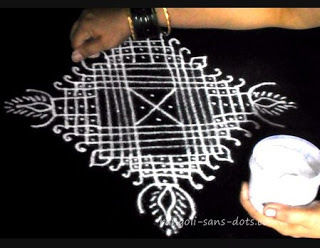 The next kolam with lines for the festival season including Varalakshmi Nonbu and Navratri upto Dasara is a different type of kolam. 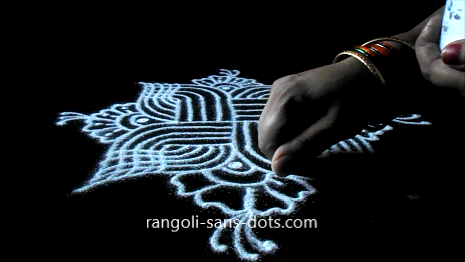 The pictures below show the step by step procedure for this simple and beautiful kolam. 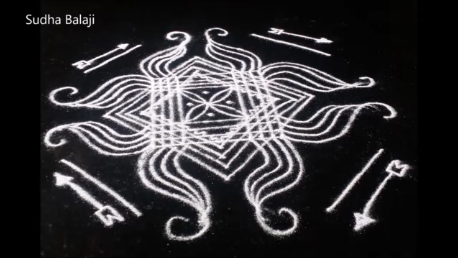 It is as if one krishnan dindu pattern has been inserted on placed on another. 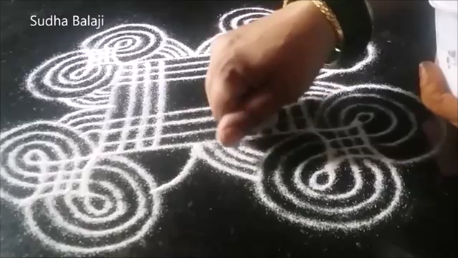 Krishnan dindu is the basic pattern with lines both straight and curved drawn on all four sides, it is called so because it resembles a bolster . 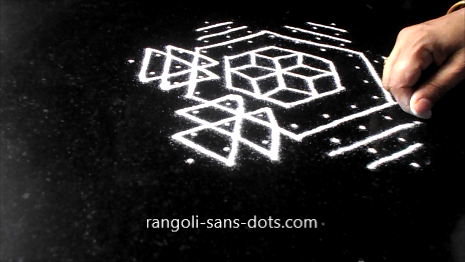 After some padi kolam , a dotted kolam that is different type and can be drawn for these festivals for the kolu or the Puja mantap. 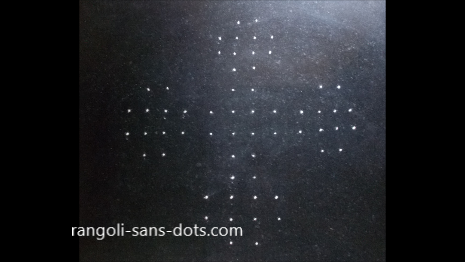 Though the kolam appears relatively big if we place the dot grid such that the gaps between the dots in any two rows or adjacent dots is less we can accommodate this kolam before the kolu display or Varamahalakshmi Puja Mantap. 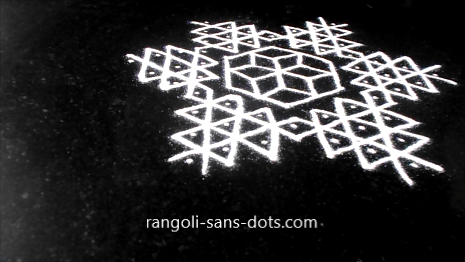 I have drawn the same type of kolam with a square pattern at the centre, this kolam has a hexagon pattern at the centre. 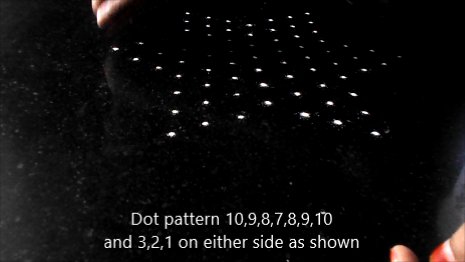 The dot pattern is 10,9,8,7,8,9,10 and 3,2,1 dots on either side ( these dots start from the fourth dot of the row with 10 dots ) . 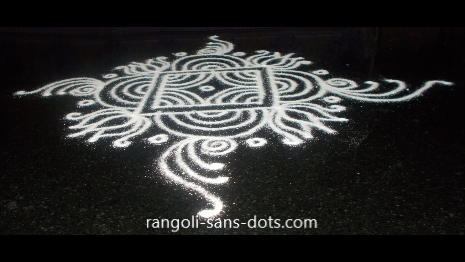 This is quite a common kolam. 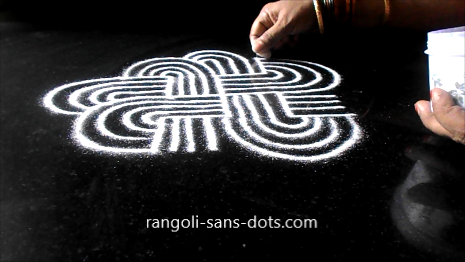 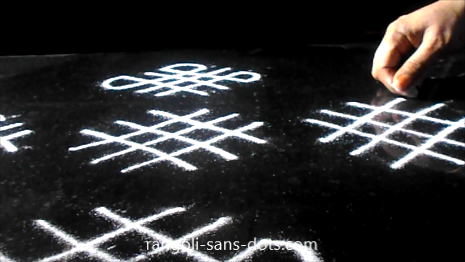 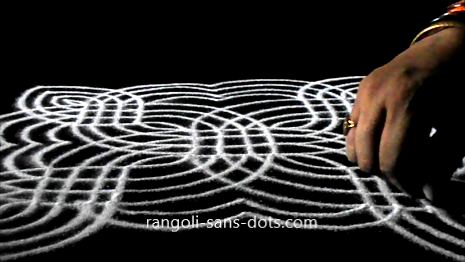 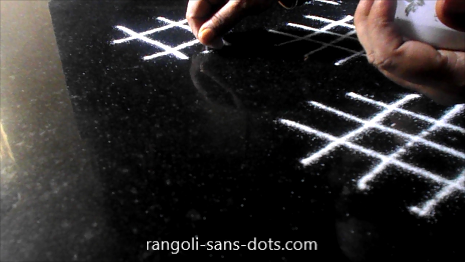 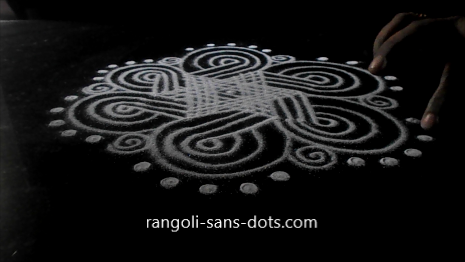 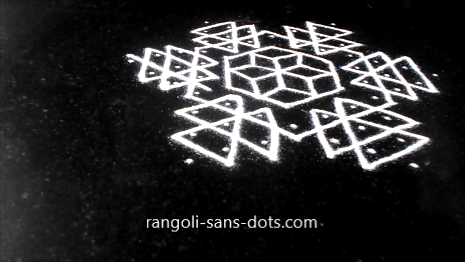 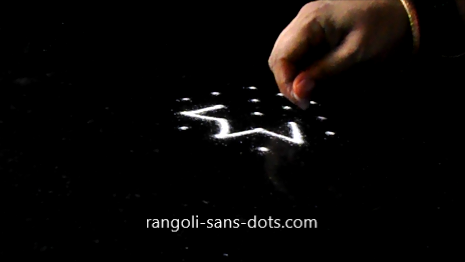 The kolam lines are drawn outside the dot grid in this type of kolam designs / rangoli designs. 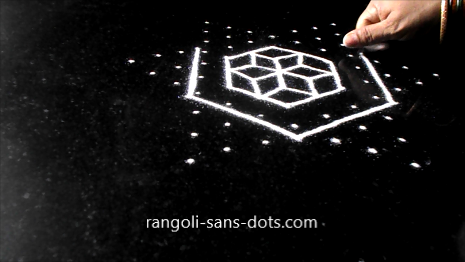 Place the dot grid, draw the pattern at the centre, then connect the edges to get a hexagon, outside this draw a bigger hexagon. 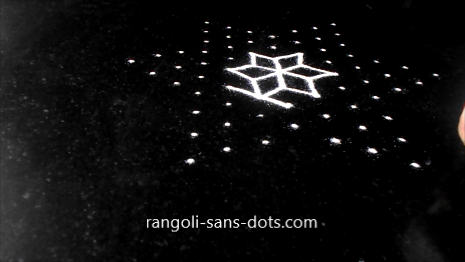 The remaining dots in the star shaped dot pattern formed can be used to form patterns so that all the dots are used up. 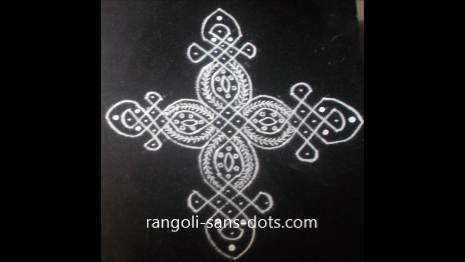 We can some simple designs at the centre. 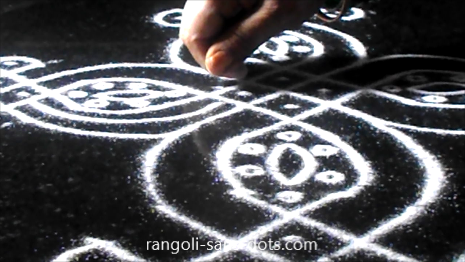 The nine pictures below, I think will be sufficient to know the steps and procedures for this kolam. 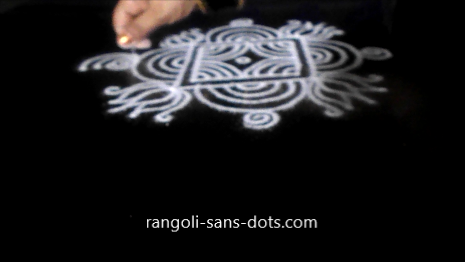 It is not as simple as it appears to be and we need some practice. 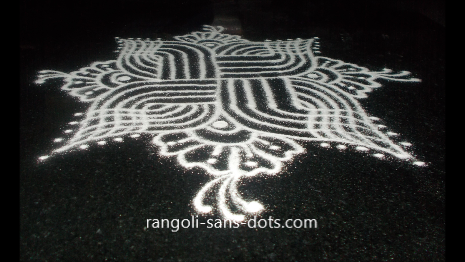 This kolam , I created when I was trying a simple and different lines kolam. 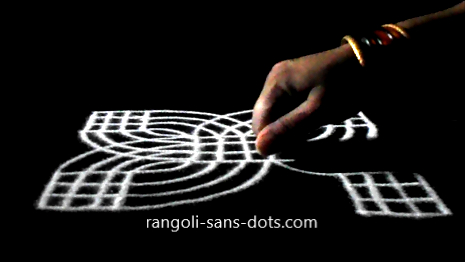 This can be drawn with four lines or five lines. 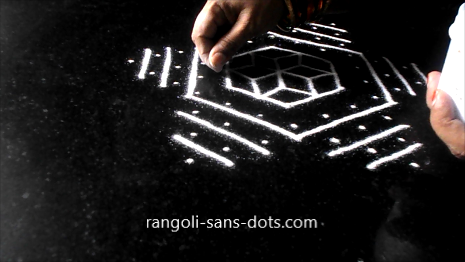 Instead of the usual square pattern we start a padi kolam with , I have used a hexagonal pattern to start this rangoli design with lines. 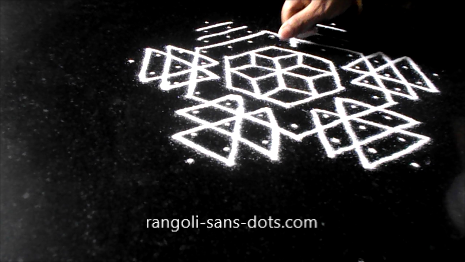 After drawing the hexagon, extend with lines from all the six edges parallel ( as humanly as possible ) to the line below. 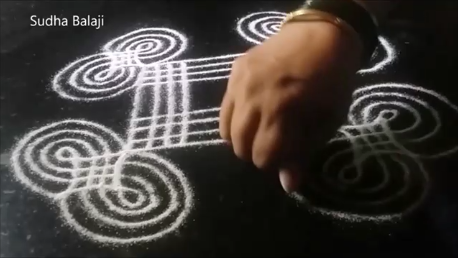 Draw two more lines between these lines. 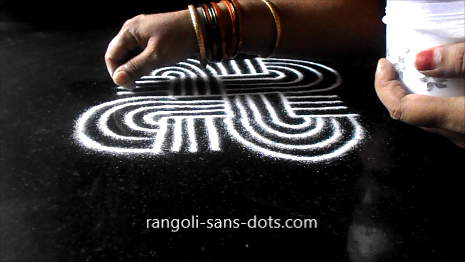 Now draw curved lines from the four straight lines to get a beautiful and simple padi kolam line. 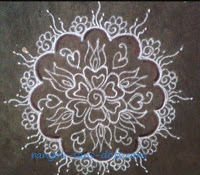 Since it is a relatively small kolam we can draw for the Navarathri golu on Friday or for Varalakshmi Vratham decoration before the mandapam. 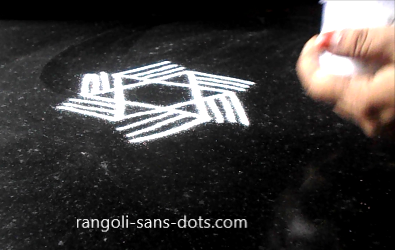 Adding free hand decorations around the kolam is according to our imagination. 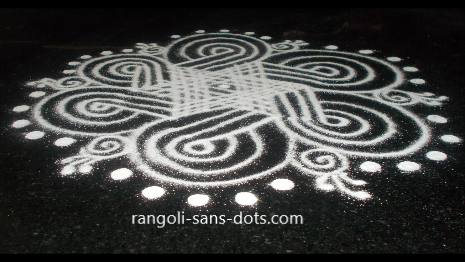 I have placed dots and pressed them with fingers to make them flat and round to a different type of kolam. 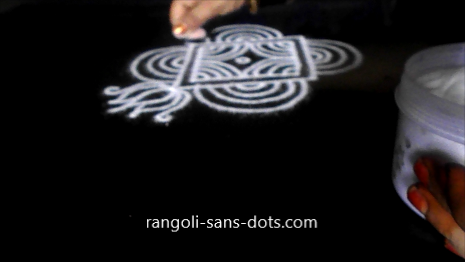 The pics below should help us in knowing the step by step procedure to draw this kolam. 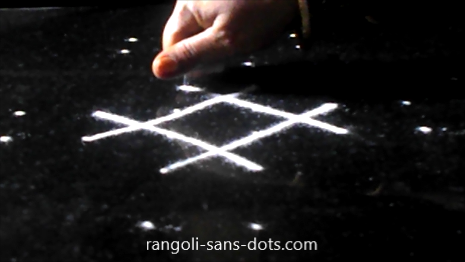 Another simple lines kolam design with a star pattern is shown step by step in the pictures below. 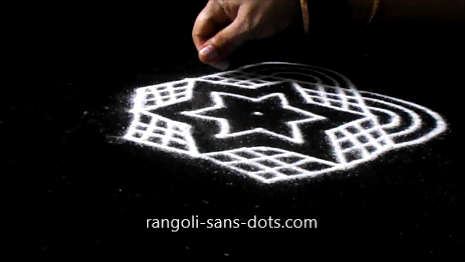 The central star pattern can be drawn free hand . 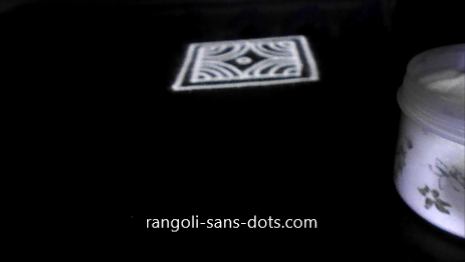 I have used a 5,4,3 dot pattern. 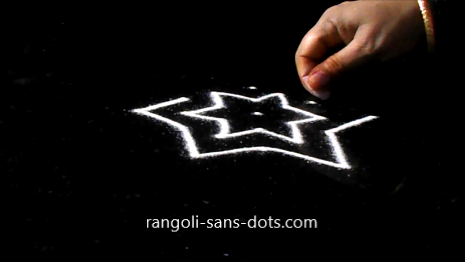 Draw the star shaped pattern and draw one more similar pattern outside . 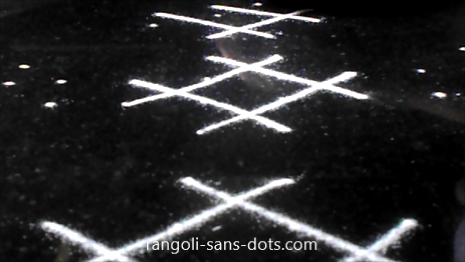 Connect lines to form parallelogram shapes on six sides. 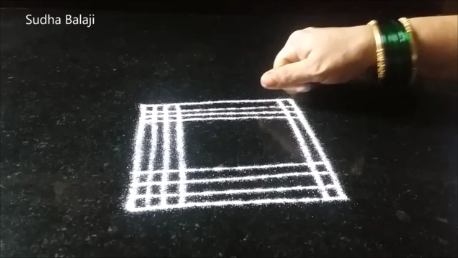 Draw intersecting lines inside the parallelograms . 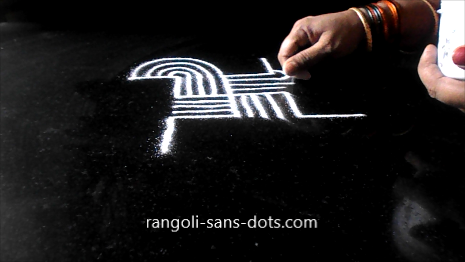 Connect the lines in adjacent geometric shapes ( parallelograms ) with curved lines - we get three lines the fourth line is the one connecting adjacent shapes, because it is tradition to use four or five lines for lines kolam designs. 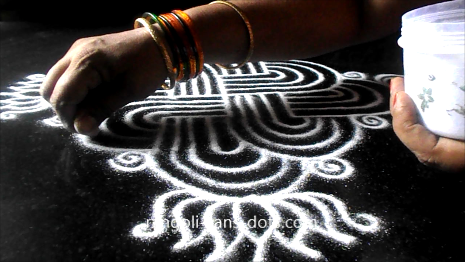 Hope the pictures below give an idea of how to proceed with this easy lines kolam. 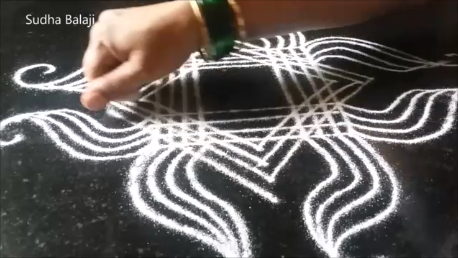 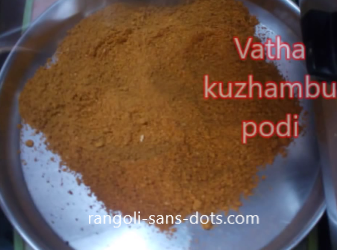 Kaavi or ochre powder mixed in water is used to make a border along the contours of the kolam to signify that it is drawn for an auspicious festival. 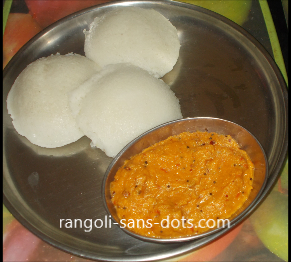 Thanks Devi for the appreciation. 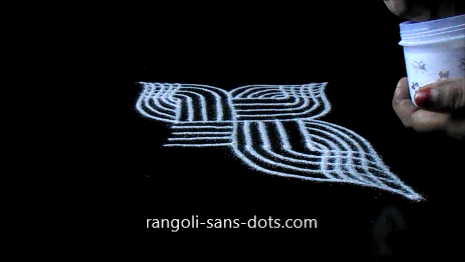 I love to draw parallel line rangoli. 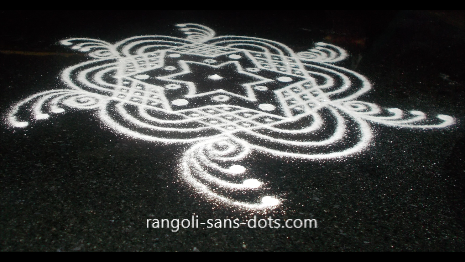 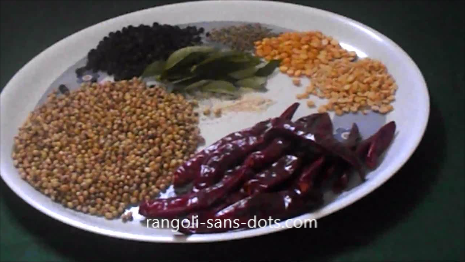 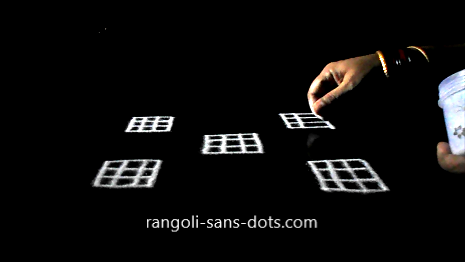 Have you visited my YouTube Channel Rangolisansdots ? 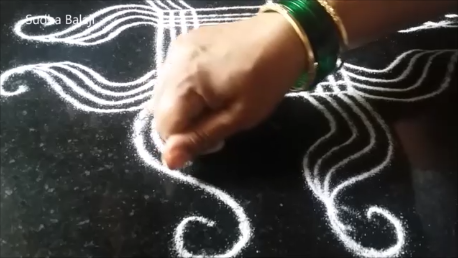 Sudha.. 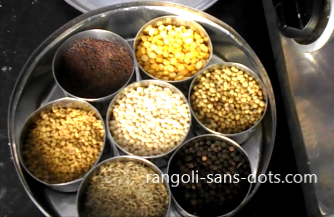 I just had a visit to your channel and they are splendid. 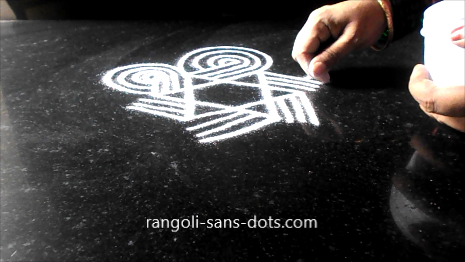 A suggestion from my end - You could also add the youTube channel link on this website(just like G+)..
Keep up doing this Art work. 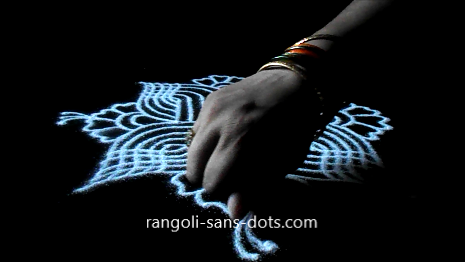 Your Rangoli's are awesome and unique mam.. 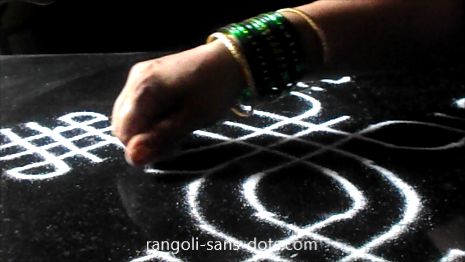 Such a nice blog.. Good work mam..